Dr. Twiss has been in the academic arena for over 30 years in the area of women's health. Life long learning has been a passion of hers. She worked part time in maternity nursing and was especially interested in high risk perinatal nursing. She is now a woman's health nurse practitioner and has a high interest in perimenopausal and menopausal women, which is her focus of nursing research. 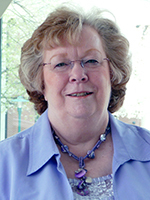 Working with students to develop a passion for learning and for nursing has been a major emphasis in her career. She has been with the university for over 25 years. Is co-investigator on NINR federally funded research grant in "Prevention of Osteoporosis in Breast Cancer Survivors"
"Breastfeeding Satisfaction, Breast feeding Self Efficacy, Transition to Parenting in Mothers of Normal and Preterm Infants"
"Perimenopausal Symptoms, Quality of Life, and Health Behaviors in Users and Nonusers of Hormone Therapy"
2017 Learning Analytics for Assessing Critical Thinking and Student Engagement to Improve Instructor Feedback: A Mixed Methods Study. (UNMC Interprofessional Academy of Educators). Kotcherlakota, S. (PI), Twiss, J. (PI), Beam, E., Lasher, E., Moser, D., Kinney, S., Ford, A., Cera J., & Wisnieski, D.